LAKE BUENA VISTA, Fla. (Feb. 8, 2017) – A group of injured veterans and their families were served eggs with a side of time travel during a recent breakfast at the Walt Disney World® T-REX™ restaurant with Wounded Warrior Project® (WWP). As they enjoyed a meal in a unique and imagination-inducing environment, warriors experienced firsthand what is possible at gatherings that get them out of the house and connected with fellow service members. These connection activities support the long-term recovery needs of warriors by reintroducing them to the unique bonds experienced during military service. Isolation is one of the most significant struggles veterans deal with after serving their country. It can be difficult knowing how to overcome that challenge and rekindle those friendships. 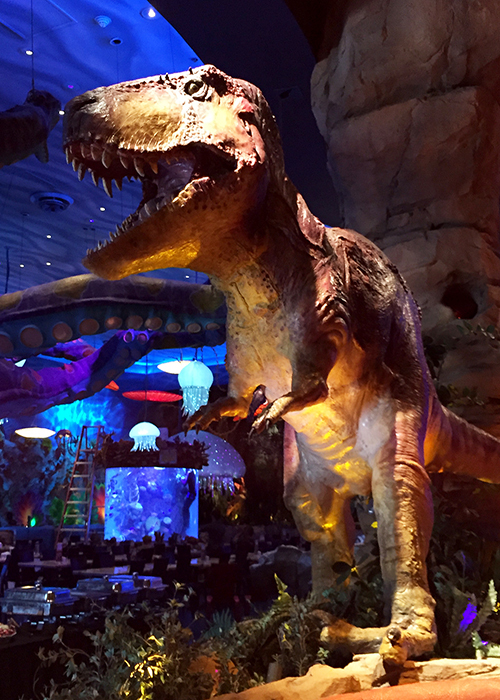 More than 50 participants attended a buffet-style breakfast, set up in the midst of prehistoric creatures and vegetation. Children were treated to a special surprise when they were invited to build customized dinosaurs. Over the course of the meal, veterans interacted with fellow warriors in their area and met the leader of their local Peer Support Group. Peer support plays an important role in the recovery process as injured veterans rely upon one another’s learned experiences when managing day-to-day challenges. All WWP programs and services have an aspect of this support structure, while the Peer Support program is solely dedicated to ensuring every injured veteran, family member, and caregiver encourages one another in recovery, thus embodying the WWP logo of one warrior carrying another off the battlefield. While enjoying breakfast, WWP staff members advised attendees of additional services to assist in their recovery processes. Programs help injured veterans with mental health, physical health and wellness, career and benefits counseling, and connecting with other warriors and their communities. Through the generosity of donors, these programs are available to warriors and their families at no cost to them. To learn and see more about how WWP’s programs and services connect, serve, and empower wounded warriors, visit http://newsroom.woundedwarriorproject.org/ and click on multimedia.